Writer, and composer of synagogal hymns; flourished in Rome during the thirteenth century; died after 1284 in the prime of life. He was the earliest literary member of the Rossi family. His wife was Paola Anaw, the highly gifted daughter of the author Abraham ben Joab Anaw (see Jew. Encyc. i. 567b). 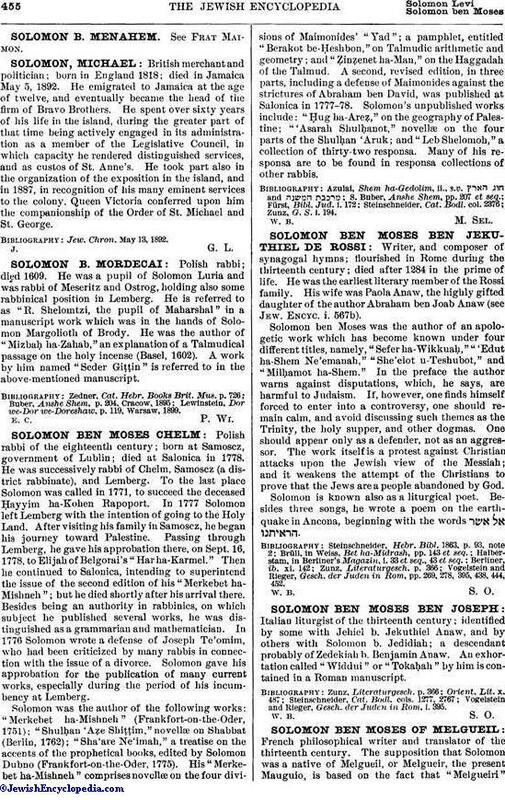 Solomon ben Moses was the author of an apologetic work which has become known under four different titles, namely, "Sefer ha-Wikkuaḥ," "'Edut ha-Shem Ne'emanah," "She'elot u-Teshubot," and "Milḥamot ha-Shem." In the preface the author warns against disputations, which, he says, are harmful to judaism. If, however, one finds himself forced to enter into a controversy, one should remain calm, and avoid discussing such themes as the Trinity, the holy supper, and other dogmas. One should appear only as a defender, not as an aggressor. The work itself is a protest against Christian attacks upon the Jewish view of the Messiah; and it weakens the attempt of the Christians to prove that the Jews are a people abandoned by God. Solomon is known also as a liturgical poet. Besides three songs, he wrote a poem on the earthquake in Ancona, beginning with the words . Vogelstein and Rieger, Gesch. der Juden in Rom, pp. 269, 278, 395, 438, 444, 452.